- Publisher These ideas and activities have been tried and tested by families like yours. They are designed to make lasting impressions on children of all ages.Have fun with these simple science experiments that use items commonly found in the home to teach important truths from God's Word. For example:*Attempt to crush a raw egg to learn about God's protection. *Make candies "spark" and learn how to be a light in the world. *Watch how peas fall out of a glass and learn to follow God, not the world. *Make a rainbow and be reminded how God kept His promise to Noah. *See how a hard-boiled egg can be sucked into a glass bottle and discover that nothing is impossible with God. - Publisher Featured on Focus on the Family, FamilyLife Today, and Promise Keepers lt;br> Creating lasting impressions for the next generation! These ideas and activities have been tried and tested by families like yours. They are designed to make lasting impressions on children of all ages. lt;br> Have fun with these simple science experiments that use items commonly found in the home to teach important truths from God's Word. For example: lt;br> amp; Attempt to crush a raw egg to learn about God's protection. amp; Make candies "spark" and learn how to be a light in the world. amp; Watch how peas fall out of a glass and learn to follow God, not the world. amp; Make a rainbow and be reminded how God kept His promise to Noah. amp; See how a hard-boiled egg can be sucked into a glass bottle and discover that nothing is impossible with God. 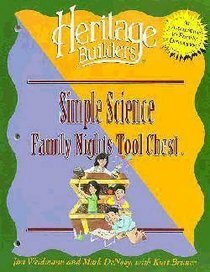 About "Family Nights: Simple Science"
These ideas and activities have been tried and tested by families like yours. They are designed to make lasting impressions on children of all ages.Have fun with these simple science experiments that use items commonly found in the home to teach important truths from God's Word. For example:*Attempt to crush a raw egg to learn about God's protection. *Make candies "spark" and learn how to be a light in the world. *Watch how peas fall out of a glass and learn to follow God, not the world. *Make a rainbow and be reminded how God kept His promise to Noah. *See how a hard-boiled egg can be sucked into a glass bottle and discover that nothing is impossible with God. Featured on Focus on the Family, FamilyLife Today, and Promise Keepers lt;br> Creating lasting impressions for the next generation! These ideas and activities have been tried and tested by families like yours. They are designed to make lasting impressions on children of all ages. lt;br> Have fun with these simple science experiments that use items commonly found in the home to teach important truths from God's Word. For example: lt;br> amp; Attempt to crush a raw egg to learn about God's protection. amp; Make candies "spark" and learn how to be a light in the world. amp; Watch how peas fall out of a glass and learn to follow God, not the world. amp; Make a rainbow and be reminded how God kept His promise to Noah. amp; See how a hard-boiled egg can be sucked into a glass bottle and discover that nothing is impossible with God.